Many associations, clubs and non-profits are struggling to recruit and engage younger members – especially “Generation Y” or Millennials. Some organizations are experiencing membership decline, due to the lack of new blood or younger members joining. Others are struggling to figure out how to get the young members they do have involved. But with the statisticians telling us that Gen Y will overtake the Baby Boomer population in the workforce as soon as next year, the time to engage this generation is now! 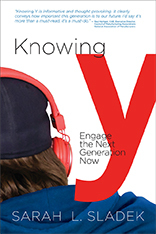 I recently had a chance to review Sarah Sladek’s latest book: Knowing Y: Engage the Next Generation Now, from ASAE's publishing arm, Association Management Press. In this book, Sladek offers insight and advice on how to connect with Generation Y, and explains that this generation has a different set of needs, interests, values as well as different communication, buying and engagement behaviors. But most importantly, Sladek outlines the implications these needs and interests have for every functional area of associations from advocacy to technology to websites. This book isn’t just about a generation. It’s about change; the kind of change that only comes around every hundred years or so. ...as people age, their instinct of social conversation becomes stronger, which inevitably brings them in conflict with the normal attribute of youth, which is innovation. In other words, it’s natural for older generations to resist change, but this resistance can have negative side effects, not excluding generational differences and even conflict when interacting with younger generations who have an insatiable desire for innovation. So to connect with this generation, perhaps we need to let go of our past traditions and let Gen Y help steer our associations, clubs and non-profits in a different direction. The Air Traffic Controllers Association, which shifted its focus to Gen Y in 2011 resulting in a 30 percent membership increase and 25 percent increase in event attendance of all generations of members. The Marine Retailers Association of the Americas, which launched a Young Leaders Advisory Council in 2009, and observed a 200 percent membership increase and $100,000 revenue increase. Associations can no longer think of themselves as an entity that people join and take great pride in referring to themselves as members...That’s an ownership behavior. Associations must now shift their expectations and think in terms of access.The pressure is on for associations to deliver continued, quick and easy access to new information, valuable services and products and meaningful relationships and experiences that deliver a real return on investment. But Gen Y are also part of “the Sharing Economy” so this generation is looking for organizations where sharing occurs – sharing of knowledge, resources, products and services. This, Sladek suggests, means that Associations will need to evolve from the “individual-must-serve-the-association” approach to membership, and instead of focus on ways to generate collaboration and sharing for the purpose of building a sharing community”. “To succeed you must know Y and why…why does our association exist? Sladek has convinced me that the more we learn about this generation and the more we embrace the change occurring during this workforce transition, the better off our organizations will be. Knowing Y: Engage the Next Generation Now is available from the ASAE bookstore. We’ve included Sarah Sladek’s book on the list of resources in our The Ultimate Guide to Connecting With and Recruiting Younger Members, a compendium of highlights and links to 10 resources that will help you better understand Millennials – available in our Membership Knowledge Hub. Thank you for reviewing my book. Happy to have Wild Apricot's favorable review! You're so welcome Sarah. Great book with powerful insight for membership organizations.